Have you ever decided to power through your day, feeling like you have so much to do that you can’t take any breaks? Have you ever expected your team to power through the day – and perhaps even the night – and frowned upon anyone stepping away from the work that has to get done? 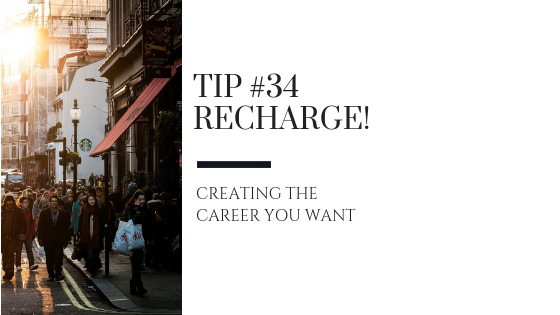 It may seem counter-intuitive, but it is precisely when you are under this type of pressure that it becomes critical for you and your team to take breaks to recharge. Research shows that we can optimally focus for just 90-120 minutes at a time. If we go longer than this, our attention wanes and our productivity decreases. Take periodic renewal breaks during your workday in order to maximize your productivity. What constitutes an effective renewal break for you? What is it that you can engage in for a limited amount of time that will clear your mind and help you regain your focus? If physical activity is the answer, consider going for a short walk, climbing the stairs, or practicing yoga. If social interaction stimulates you, walk over and talk to a colleague, take a coffee break with a friend, or call a family member and talk for a few minutes. To clear your mind and center yourself, you might consider listening to some music, meditating, or doing some breathing exercises. If you need to refuel, get up from your desk and grab a healthy snack or drink some water. Or consider combining some of these ideas – how about listening to music as you take a walk, or having lunch outdoors with a friend? A renewal break doesn’t have to take a long time. If you’re intentional about the activity, it can be just 5 or 10 minutes long. Make it a habit to take renewal breaks and notice how your overall productivity and sense of well-being improves. And, while you’re at it, make sure your team does the same.